Tests whether a value is blank or a table contains no records, and provides a way to create blank values. Blank is a placeholder for "no value" or "unknown value." A Text input control is blank if the user hasn't typed any characters in it. The same control is no longer blank as soon as the user types a character in it. 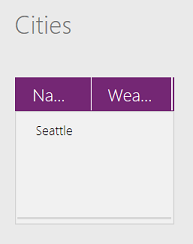 Some data sources can store and return NULL values, which are represented in PowerApps as blank. At this time, storing blank values is supported only for local collections. We know that many data sources support blank (NULL) values, and we're working to lift this limitation. Any property or calculated value can be blank. For example, a Boolean value normally has one of two values: true or false. But in addition to these two, it can also be blank. This is similar to Microsoft Excel, where a worksheet cell starts out as blank but can hold the values TRUE or FALSE, among others. At any time, the contents of the cell can be removed, and it would return to a blank state. Empty is specific to tables that contain no records. The table structure may be intact, complete with column names, but no data is in the table. A table may start as empty, take on records and no longer be empty, and then have the records removed and again be empty. The Blank function returns a blank value. Use this to store a NULL value in a data source that supports these values, effectively removing any value from the field. The return value from the Blank function. A control property has no formula set for it. No value is typed into a text-input control, or no selection is made in a listbox. You can use IsBlank to provide feedback that a field is required. A string that contains no characters has a Len of 0. An error occurred in a function. Often, one of the arguments to the function wasn't valid. Many functions return blank if the value of an argument is blank. Connected data sources, such as SQL Server, may use "null" values. These values appear as blank in PowerApps. The else portion of an If function wasn't specified, and all conditions were false. You used the Update function but didn't specify a value for all columns. As a result, no values were placed in the columns that you didn't specify. The Coalesce function evaluates its arguments in order and returns the first value that isn't blank. Use this function to replace a blank value with a different value but leave non-blank values unchanged. If all of the arguments are blank, then the function returns blank. All arguments to Coalesce must be of the same type; for example, you can't mix numbers with text strings. Coalesce( value1, value2 ) is the more concise equivalent of If( Not( IsBlank( value1 ) ), value1, value2 ) and doesn't require value1 to be evaluated twice. The IsEmpty function tests whether a table contains any records. It's equivalent to using the CountRows function and checking for zero. You can check for data-source errors by combining IsEmpty with the Errors function. The return value for both IsBlank and IsEmpty is a Boolean true or false. Value(s) – Required. Values to test. Each value is evaluated in order until a non-blank value is found. Values after the first non-blank value aren't evaluated. Value – Required. Value to test. Table - Required. Table to test for records. At this time, the following example only works for local collections. We know that many data sources support blank (NULL) values and We are working to lift this limitation. Create an app from scratch, and add a Button control. Preview your app, click or tap the button that you added, and then close Preview. On the File menu, click or tap Collections. Click or tap the back arrow to return to the default workspace. 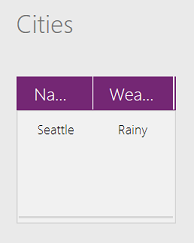 The label shows false because the Weather field contains a value ("Rainy"). The Weather field of the first record in Cities is replaced with a blank, removing the "Rainy" that was there previously. The label shows true because the Weather field no longer contains a value. Create an app from scratch, add a text-input control, and name it FirstName. By default, the Text property of a text-input control is set to "Text input". Because the property contains a value, it isn't blank, and the label doesn't display any message. Remove all the characters from the text-input control, including any spaces. Because the Text property no longer contains any characters, it's blank, and IsBlank( FirstName.Text ) will be true. The required field message is displayed. For information about how to perform validation by using other tools, see the Validate function and working with data sources. This collection has two records and isn't empty. IsEmpty( IceCream ) returns false, and CountRows( IceCream ) returns 2. Preview your app, click or tap the second button, and then close Preview. The Clear function removes all the records from a collection, resulting in an empty collection. IsEmpty( IceCream ) returns true, and CountRows( IceCream ) returns 0.